ANAHEIM – The JSerra girls basketball team showed how battle-tested it is by beating Fairmont Prep 56-54 on Thursday night in the first round of the CIF-SS Division 1 playoffs. The Lions, ranked No. 10 in the county, trailed the No. 6 Huskies (14-14) by double digits at halftime and by seven at the start of the fourth quarter. JSerra went on a 15-0 scoring run in the beginning of the third quarter and an 8-0 run in the fourth quarter. JSerra (17-10) clearly benefited from playing one of the most challenging schedules in Orange County this season. The Lions beat JW North and Folsom earlier this season, both teams ranked in the top 50 in the state. JSerra played No. 1 Mater Dei and No. 2 Rosary in the Trinity League as well. "I told the team before they game that they were prepared because they have played a tremendous level of competition in tough venues," JSerra coach Mary Rossignoi said. "They never quit and they played for each other against a great team." JSerra went on a 15-0 run to start the third quarter which prompted a timeout by Fairmont Prep. The Huskies responded with a 12-0 run of its own to take a seven-point lead into the fourth quarter. The Lions went on an 8-0 run in the fourth to take a one-point lead. The two teams traded leads three more times after that. JSerra freshman Jamie Mackay made two free throws to put the Lions ahead by four with under a minute remaining. Fairmont Prep guard Izzy Om made a three-pointer with 29 seconds left to cut the JSerra lead to one. Alex Iemsisanith and Sarah Shaw made clutch free throws in the final seconds to put the game away for the Lions. 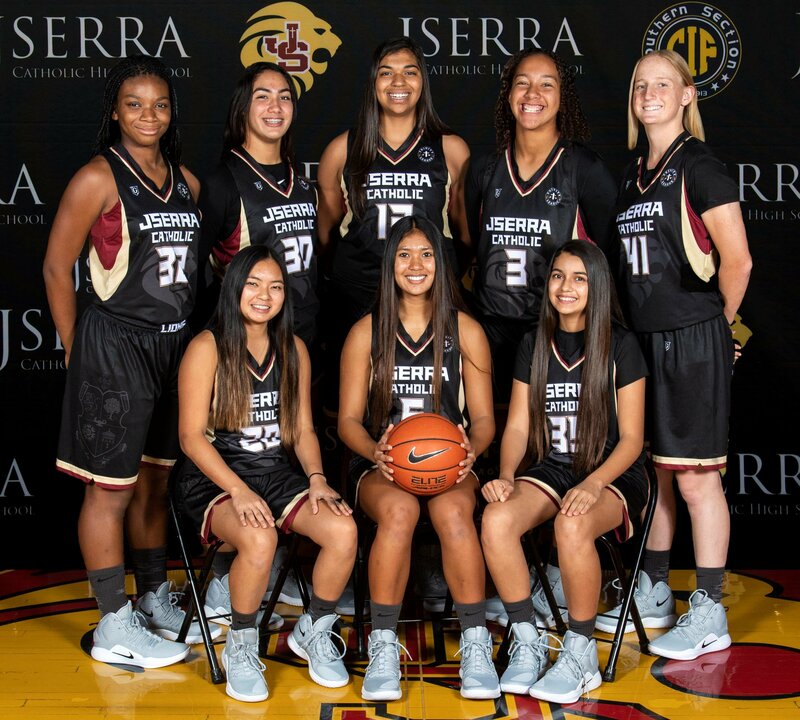 Iemsisanith led JSerra in scoring with 13 points. The Lions forwards used their size advantage to outrebound the Huskies 34-22. Ava Carter led JSerra with 17 rebounds and Shaw had a double-double with 11 points and 10 rebounds. "They are huge every game and it's a big reason why we are so successful," Rossignoi said of Carter and Shaw. "They have bought into our defensive concepts and understand the importance of rebounding and holding the other team to one shot." Fairmont Prep won the competitive San Joaquin League this season with an 8-0 league record. Om led the Huskies with 21 points and made five 3-pointers. Anling Su Vera was a catalyst for the Fairmont Prep offense, dishing out nine assists. JSerra will host Chaminade of West Hills on Saturday in the second round of the playoffs. Chaminade won the Mission League and routed Canyon of Canyon Country in its first-round matchup. Come out and Support JSerra Girls Basketball as they head into their Second game of CIF Playoffs! The Lady Lions will be playing Chaminade at home on Saturday, February 9th @ 7 p.m.
As a CIF playoff game, tickets will be sold per CIF rules for the game. Tickets sales begin at 6:00 p.m. on Saturday.